Generic interface to separable image reconstruction filters. When resampling bitmaps or adding radiance-valued samples to a rendering in progress, Mitsuba first convolves them with a so-called image reconstruction filter. Various kinds are implemented as subclasses of this interface. When resampling data to a different resolution using Resampler::resample(), this enumeration specifies how lookups outside of the input domain are handled. Clamp to the outermost sample position. Assume that the input repeats in a periodic fashion. Assume that the input is mirrored along the boundary. Assume that the input function is zero outside of the defined domain. Assume that the input function is equal to one outside of the defined domain. 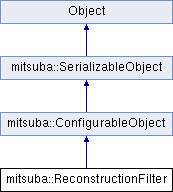 Create a new reconstruction filter. Perform a lookup into the discretized version. Return the block border size required when rendering with this filter. Serialize the filter to a binary data stream.